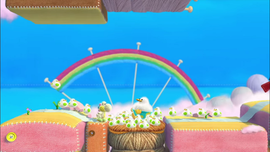 Fluffin' Puffin Babysitting is the fifth level of World 3 in Yoshi's Woolly World. Immediately upon the start of the level, a Fluffin' Puffin parent appears along with the chicks. After throwing two chicks, another family appears, followed by a third. After a fourth, a Koopa Paratroopa and a Piranha Plant appear, followed by a more vertical segment and more Piranha Plants. The first checkpoint appears afterwards, along with more Fluffin' Puffin families and more Piranha Plants. Wild Ptooie Piranhas begin appearing and shooting Pokey Poms. After a while, the second checkpoint appears. After a diagonal segment featuring many Koopa Paratroopas, the Goal Ring awaits. Smiley Flower 1: After the second Fluffin' Puffin family, Yoshi must throw a chick up and to the left, leading directly to the Smiley Flower. Smiley Flower 2: There is a Chomp Rock to the left of the third Piranha Plant that can be summoned by eating the edible wall blocking it, and when rolled to the right it will lead directly to the Smiley Flower. Smiley Flower 3: Just before the second Fluffin' Puffin family after the first checkpoint, Yoshi must throw a Fluffin' Puffin chick to the left on the platform below, then use the chick's trail to reach the Smiley Flower. Smiley Flower 4: In an alcove guarded by several Piranha Plants. To obtain it, Yoshi must throw a Fluffin' Puffin chick to allow Pokey Poms shot by the nearby Wild Ptooie Piranha defeat the Piranha Plants, clearing them out and allowing access to the Smiley Flower. Smiley Flower 5: Below a platform not too far after the second checkpoint, guarded by two Piranha Plants. Wonder Wool 1: Just before the first Koopa Paratroopa, there is an edible wall, traveling past it leads Yoshi to a green warp pipe. Inside the secret area, Yoshi must throw a Fluffin' Puffin chick to an opening with a breakable block and a Present Box, which contains the Wonder Wool. Wonder Wool 2: In an alcove, guarded by the first Piranha Plant. Wonder Wool 3: Immediately after the third Smiley Flower, Yoshi must enter an alcove in a group of Piranha Plants, then, one landing, head to the right to get to the Wonder Wool. Wonder Wool 4: Yoshi must go after a green warp pipe behind a Wild Ptooie Piranha just before the second checkpoint. Inside the secret room, he must use a Fluffin' Puffin chick to guide a Chomp Rock to break two blocks emcompassing the Wonder Wool. Wonder Wool 5: In a visible Winged Cloud just before the goal roulette. 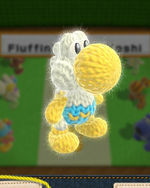 Collecting all of the Wonder Wools knits Fluffin' Puffin Yoshi back together. This page was last edited on October 28, 2018, at 12:45.